Here we discuss how holistic supply chain finance can be used to improve supplier's health, accelerate time-to-market, and enable postponement of differentiation. In Part 2 of this series we examined how taking a holistic approach to supply chain finance impacts margins and profitability by lowering risk for lenders, lowering the cost of capital for suppliers, and lowering COGS for the buyer. In this article, we look at some less widely known benefits including improvements to continuity of supply, time-to-market, and postponement of differentiation. With traditional trade finance instruments, the choices tend to place the burden of risk or expense onto the buyer or seller. An Open Account approach, which has been rising in popularity, is good for the buyer, but creates significant collection risk for the supplier. Collection can be particularly difficult when an overseas buyer defaults on payment. Conversely, Letters of Credit add significant time and expense for the buyer, and advanced payment puts all of the risk on the buyer. The beauty of a Network-based SCF approach is that it significantly reduces expense and risk for both parties. A key component of supplier risk management for many companies is monitoring the supplier’s financial health and viability to try and obtain early warning of potential supplier issues that could impact the continuity of supply. However, by itself, supplier monitoring misses opportunities to actually bolster and improve the supplier’s financial health, which is particularly important for those suppliers that are highly leveraged and/or have cash flow challenges. Holistic supply chain finance can make it easier for those suppliers to obtain financing, earlier in the process, and at a lower cost of capital. For suppliers that are in a cash crunch, this lifeline could make the difference between insolvency vs. survival. From the buyer’s perspective, this can be especially critical for one-of-a-kind suppliers that are difficult or nearly impossible to replace. And it is accomplished without the buyer having to inject their own funds to bail out the supplier. Instead, holistic SCF creates a healthier supplier, rather than providing temporary ‘life support’ to an ailing supplier at a cost to the buyer. It is not just about lower interest rates, but also the ease of access to capital. 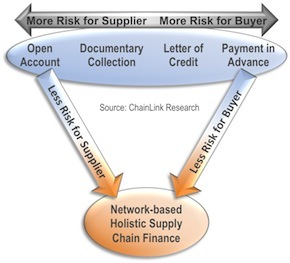 A holistic SCF network-platform approach is not traditional supplier financing. There are no lines of credit, covenants, or pledging of assets needed in this environment for a supplier to gain access to capital. It is a much simpler process for them, built right into the supplier’s sale-to-cash process. And it complements rather than replaces the supplier’s existing bank relationship. For anyone responsible for managing supplier relationships, supply chain risk, and continuity of supply, the use of a holistic supply chain finance strategy should be one of the key tools used to keep their suppliers financially healthy. One of the fundamental responsibilities of supply chain managers is reducing cycle times throughout the business and its supply chain. As the pace of competition continually accelerates, it becomes increasingly critical to reduce the time-to-market for introduction of new products. Very few people associate supply chain finance with the ability to compress lead times and bring products to market faster, but it actually can be an important tool in the arsenal of supply chain managers. If a supplier has cash flow challenges and difficulty obtaining further financing (as many smaller ones and some larger ones do), then they are forced to wait until they get paid before they are able to order raw materials. Labor is their highest component of cost (especially for the types of labor-intensive, hard-to-automate manufacturing that has moved to low-cost labor countries), so when push comes to shove and the supplier has limited cash, they must pay their workers and will virtually always delay purchasing raw materials if they don’t have the funds for both. These delays cascade forward, causing delays in production and shipment. Affordable access to pre-shipment financing enables earlier procurement of raw materials and thereby earlier shipment of the supplier’s products to the buyer. In particular, when that supplier is a contract manufacturer or provider of a key long lead time component, then this acceleration can make a material difference in the time-to-launch of a new product for the buyer. With today’s ultra-short product lifecycles, that can make a real difference in competitiveness. Supply chain managers will often seek ‘postponement’ or ‘differed-differentiation’ strategies, so that they can postpone certain decisions until they have greater clarity about actual demand in the market. For certain types of products (apparel is a good example), it is very common for the buyer, early in the cycle, to have pretty high confidence in the overall quantities they are going to sell into a category, but not know the specifics of which style, size, color mix they will sell until considerably later, usually when they actually start selling. In a traditional setting, with lack of visibility, the buyer is forced to make a one-time buy of the entire quantities, and take their best shot at size, color, style mix … often with very painful results (big shortages of the hot items and big markdowns on the dogs). When buyers have the visibility of the network-platform, and their supplier has the confidence of a firm order for the overall quantities, then the supplier can buy the raw materials earlier in the process. With precise visibility into the supplier’s production status, the buyer knows exactly when the dyeing will start and knows when they need to make their color decisions. They can see when the cutting will start and when they need to make their style and size decisions. They can even instruct the manufacturer to postpone production of a certain portion of the raw materials until they see which colors, styles, and sizes will be hot sellers and then instruct the supplier to produce more of those. The added cost of somewhat smaller production runs is more than offset by a potentially dramatic increase in sales of the hot items and reductions in markdowns. This concept can even extend to postponement of shipment destination decisions until the items arrive at the deconsolidation point. In Part 4 of this series, we discuss foundational capabilities required in order to implement a holistic approach to supply chain finance.